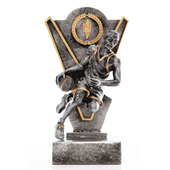 Resin Male Football Award with Y backdrop (1" centre). Personalised engraving plate and centre sticker can be added. Perfect for any awards ceremony or football competition.